A laboratory for new media arts and technologies is created within the changing landscape of industrial culture. The former coal mine becomes an emergent space for integrative projects in artistic and scientific research and cultural production. This laboratory for communications technologies, interactive media, performance and virtual environments was initiated in the summer of 2003, creating attention for the work of transformation and infrastructural transition. The second lab will convene in July 2004. The lab examines the links between reality and virtuality, body and environment, movement, sound, visual space, and postindustrial nature and architecture.The workshop participants, artists, choreographers, composers, programmers, and scientists, explore computer-generated audio-visual architectures, which are transformed by the bodily movements of visitors or performers into singular audio-visual processes and kinesthetic experiences. The development of multimedia convergences, sensitive environments and networked performance as a basis of research into interactive communications media and innovative technologies will be supported in the coming years by the new Interaction-Laboratory Göttelborn. The workshops 2003 and 2004 is funded by the IKS (Industriekultur Saar gmbH) and private sponsors, and will lead to the long-term installation of the INTAKT lab on-site. The results of the workshop will be presented during a final weekend event, which also draws attention to the transformation or future uses of the industrial facilities. "Stage" is not understood here as a theatrical space, but as a "virtual lab," as fluid architecture of a transformable, flexible space of the imagination in the processual work with new media. 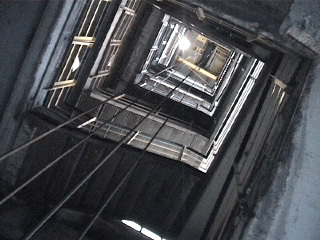 In the context of contemporary research-integration and interdisciplinary media art such transformable space is also virtual -- it can move, be distributed and networked, and thus become experienceable as real-time projection onto the sensuous reality of the "urban" areas of the coal mine with all its hyperplastic dimensions. In the language of (media) architecture, such real-time transformations do not deal with concrete and steel but with biomorphic forms, generative spaces, immersive spaces and new design techniques for optical motion-sensing and environmental sensing. In view of the possibilities for networked and mediated performance, interactive video, interactive sound, and distributed communications in today's technological culture, we can think of the internet as the widest evolutionary "space" -- a constantly moving environment of interactive and dynamic cultural processes. The region of the "Industrial Culture Saar" with its former coal mines and steel factories also appears virtual, but at this point it lies dormant. Its "postindustrial future" needs to enter the network to be an exploratory ground for cultural analysis (of our history) and for innovative new technical enterprises and design research, for studies of the periphery and new joint ventures in science and art that link the discarded industrial periphery with new integrative "centers" of knowledge production, associated with universities in the region, similar laboratories in France and Luxemburg as well as independent and private research institutions in Europe and other parts of the world. 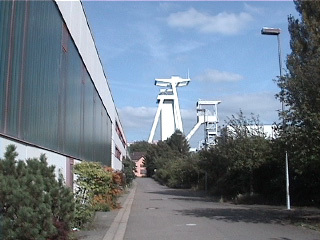 The international workshop at Göttelborn in the summer of 2003 will attract attention to the vision for a future lab, and it will bring distinguished media artists and scientists to the deserted "town" and urbane architecture of the former coal mine, challenging the visitors to discover the specific contingencies of the local site as the potential "stage" for future cultural production and innovative technological research inside the historical spaces of industrialization. The workshop is a digital Lab focused on the creation of real-time environments and distributed, networked performance. Participants will examine issues related to programming as an artistic practice, thinking creatively for and with software, and composing with real-time processing techniques. The workshop takes places in temporary, site-specific facilities housed inside the historical coal mine. A studio and equipment will be provided. In a collaborative process, an interdisciplinary team drawn from the fields of video/film, sculpture, interactive music, distributed performance, and computer science explores concepts and software solutions for motion tracking and sensing environments, real-time sound processing and streaming digital media, and creative social interfaces for actors, audience and Internet-participants The lab is particularly focused on discovering resonances between new media and re-usable historical architectures of industrial culture. The interactive lab connects the old with the new , rehearses the transformation of traditional artistic forms into creative programming with contemporary information and communications technologies, and generates dialogues between our visual, aural and kinetic perceptions in composite media architectures, accessed from anywhere in the world. As a prototype for integrative cultural research, the lab is intended as a pilot project that seeks interfaces with educators and students in the schools of the region and the neighboring countries (France, Luxemburg, Belgium, Holland) in order to provide fieldwork experiences for the young (cf. Kunst macht Schule). The public performance - "Fliegender Vogelmensch" - is an interactive installation linking several locations in the "city" of the Göttelborn coal mine; it is also intended to show the public how innovative media practices and interactive design applications can stimulate dynamic development in high tech industry sectors as well as the sectors of cultural production and education. The shared environment of science, industry and new media offers a rich potential for innovation in a wide spectrum of applications ranging from communications technology (for example, the i-mode/UMTS technology and the "Do It" Project of Telekom/DFKI-German Research Center for Artifical Intelligence), design, architecture, urban studies, socio-cultural projects, integration-research, new music, internet-art, landscape art, environmental studies, distance-learning, software development, medical and biotechnologies, transportation technology, etc. Independent media choreographer Johannes Birringer is artistic director of AlienNation Co., an international multimedia ensemble based in Houston. He has created numerous dance-theatre works, video installations and site-specific performances in collaboration with artists in Europe, North America, and Latin America. In 1999 he directed the dance-opera MIRAK and the "Vespucci" film installation which has toured internationally. In collaboration with Sher Doruff and Orm Finnendahl he created the interactive telepresence installation "East by West" at the Festspielhaus Hellerau, during a project organized by Trans-Media-Akademie Hellerau. The installation was also exhibited at the DEAF/V2 media arts festival "Data Knitting" in Rotterdam, February-March 2003. Last November he directed the polysite telepresence dance "Flying Birdman" in collaboration with seven remote sites in the US and Brazil. Over the last six years he has taught several international workshops on performance technologies in Europe and the U.S. He is the author of several books, including Theatre, Theory, Postmodernism (1991), Media and Performance: along the border (1998), and Performance on the Edge: transformations of culture (2000). He headed the Dance & Technology Program at Ohio State University and is now a Senior Research Fellow in Live Art/Digital Research at Nottingham Trent University.